You probably know by now that I drink tea and read (and write) fantasy. So obviously, it's time to combine them! 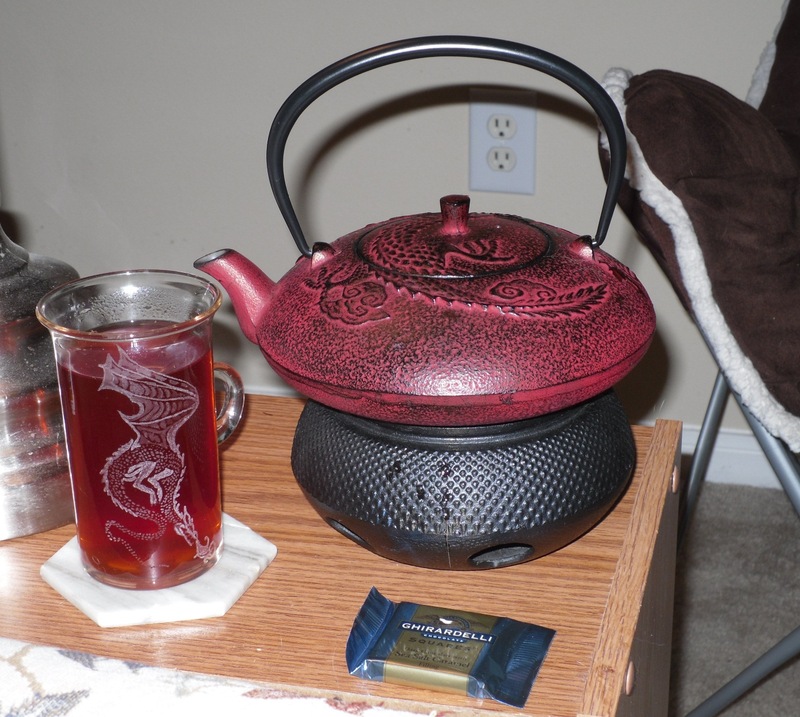 What teas would I recommend for a evening with a fantasy book? Since there are different kinds of fantasy, I've pulled out 3 well-loved subgenres. Here are my recommendations for teas to pair with each. Magic, adventure, elves and monsters, in a world with little to no modern technology--you'll want the spice of adventure and twist of sweetness of exploring a new and fantastical world, something with a touch of caffeine to get your heart racing and your mind ready for anything. But you'll also want something mellow and down-to-Earth when you're ready to return to reality, such as nice black tea. That's why I'd say an orange spice black tea, such as Constant Comment or another similar tea, would be perfect for this read. Urban fantasy is known for it's noir or dark fantasy feel. Whether it's a detective investigating the most elegant members of the seediest sides of town, or a vampire just trying to be human when his enclave is trying to take over the world, it's usually the darker parts of town where the characters edge out an existence. You'll want something dark and rich and smokey, and for that you'll find lapsang souchong, a Chinese smoked black tea, perfect with its mellow but smoky flavor. Today's world is a quick-paced, action-filled place, and a reader will want something chic and modern. But contemporary fantasy is lighter than traditional urban fantasy, and so a hint of something sweet and pleasant is welcome. Therefore a jasmine green tea is the way to: green tea, fashionable for the on-the-go, business-minded modern person with an eye for health; and jasmine, for the sweet fragrance and reminder that not everything is cut-throat in the world. Think Star Wars--science fiction blended with fantasy. For this genre, the tone is adventure, speculation, what-if. It's Earl Grey, all the way, the traditional tea of all things science fiction. Picard would proud. But more to the point, a rousing cup of Earl Grey is the perfect way to start an adventure, bracing you for anything that might come your way. With the logic of science and the endless possibility of fantasy, you'll need a hearty cup under your belt! Romance, magic, and usually the modern world: sweet with love and spicy with the touch of magic. This calls for a vanilla chai, with a healthy does of cream and sugar. The exotic spice of the chai will make magic in an ordinary world plausible, plus pair well with a zesty courtship; and the sweetness of vanilla will fill your heart like the story's inevitable happily-ever-after. What kinds of teas would you recommend for different kinds of reading?